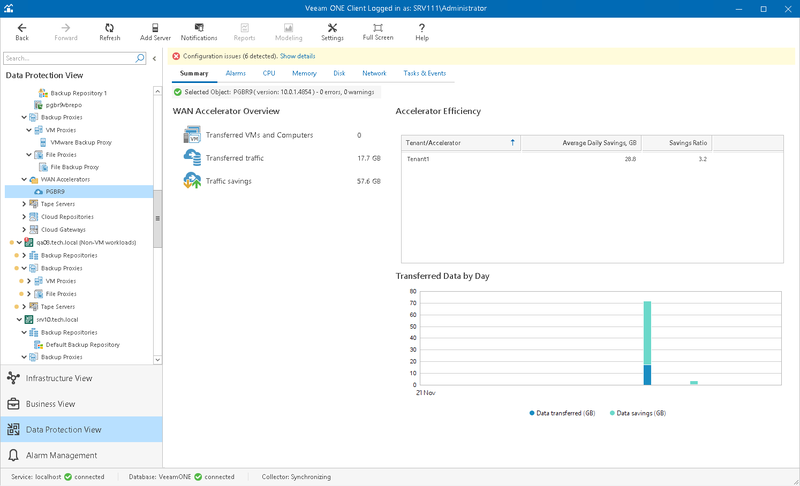 The WAN accelerator summary dashboard presents overview details and performance analysis for the chosen WAN accelerator. Number of VMs stored in restore points transferred or received by the WAN accelerator during backup copy job or replication job sessions. If the same server acts as a target- and source-side accelerator at the same time, the dashboard will show aggregate values for transferred and received restore points). Amount of network traffic transferred from the accelerator to target. Amount of saved traffic — the difference between the amount of VM data that was read from the source location (source repository or datastore/volume) and the amount of data that was actually transferred to the target destination (secondary repository or replica datastore/volume). The chart shows WAN accelerators that saved the greatest amount of traffic over the past period. The chart lists tenant or accelerator IP, the average amount of traffic the accelerator saves daily in GB, and the ratio between the amount of VM data read from the source location and the amount of data that was transferred to the destination. The chart shows the amount of VM data that was read from the source location (source repository or datastore/volume) and the amount of data that was actually transferred to the target destination (secondary repository or replica datastore/volume) over the past period.